KUCHING: Farmers and entrepreneurs will soon use the ‘Internet of things’ and special apps to manage the fertigation of crops. This is to better manage the distribution of fertiliser on crops and it is the ‘in-thing’ that the government wants to introduce for modern farming. Deputy Chief Minister Datuk Amar Dougla Uggah Embas said, ideally in the future, the farmers will just have to use a smart phone for management of fertiliser on their crops and at the same time, through data readings, enable them to save cost and boost crop production. “The farmer does not have to be at his farm and can be anywhere but yet he can still monitor and manage his farm by using a smart phone and this is the new technology that modern farming is using these days,” he said. “If we want to boost our food production and compete with other countries, we must equip our modern farming community with technologies that boost production, save cost and make profit. We hope with this kind of ideas our people will be encouraged to take up agriculture,” he added. He said this when met by reporters after inspecting the newly installed fertigation system at the Sustainable Food Production Centre (Tapak Pengeluaran Makanan Kekal) at Rampangi, Jalan Sultan Tengah near here yesterday. Uggah, who is the Minister of Modernisation of Agriculture, Native Land and Regional Development, said the government expected to use this technology at the agro-parks in the state in the future. 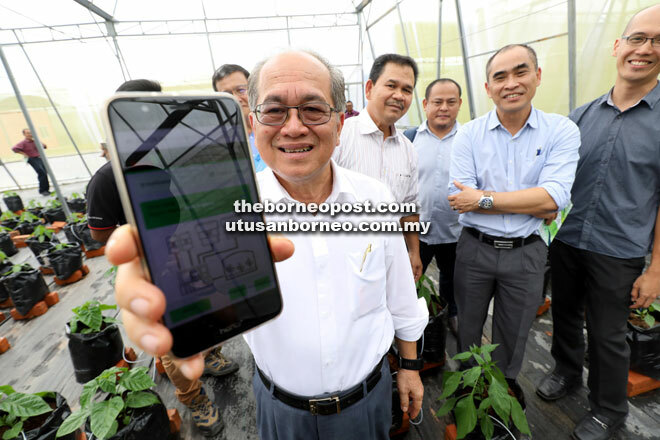 On his visit to the fertigation project at Rampangi, Uggah said he wanted to make sure that the ‘internet of things’ system works at the centre as it will be the model for modern precision farming. “We want to make sure that our agropreneurs are involved in modern agriculture in line with the philosophy of our Chief Minister on digital economy, so we planned the whole area in Rampangi centre to be installed with the system and once it works we will bring young people to see how this system works and try to get them into agriculture sector,” he said. Uggah said the system would make modern farmers more competitive and enable them to control their production. Accompanying him were the permanent secretary to his ministry Datu Ik Pahon Joyik, state Agriculture Department acting director Dr Alvin Chai and Agriculture Department research officer Johnson Chong.